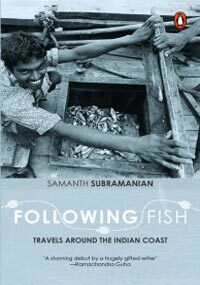 If you ever go looking for supporting evidence for the adage “never judge a book by its cover” look no further than Samanth Subramanian’s debut book “Following Fish”. A black and white photograph of a fisherman holding open the catch of the day on his boat does little to build the anticipation one should experience while opening a new book. In retrospect, this is the weakness – and the subsequent strength – of the book. With little or no expectation, we opened the first page and start ploughing through an essay on the Hilsa fish in Kolkata – or the Ilish Maach, the centre-piece of Bengali cuisine. All it took was a couple of pages before we got completely engrossed into the modern eco-system and the supply chain of the hilsa as the fish winds it way from the waters to end up on someone’s plate as Shorsher Ilish and before we knew, the fish was digested and the essay had ended. Buy the book at a great discount now! Thus begins Subramanian's travels right down the Coromandel coast on the one side and up the Malabar coast on the other from West Bengal to Gujarat. There are nine lovely essays – apart from the hilsa in Kolkata there's also the apparent cure for asthma by swallowing a live fish in Hyderabad, the historical journey of a fishing tribe in Tamil Nadu, the enthralling duet and duel between toddy and meen curry in Kerala, the state of fishing in Mangalore and Goa, the culinary differences between different traditional fish cuisines in Mumbai and the boat building industry in Gujarat. Using fish as a metaphor for travels around the Indian coast in an inspirational idea – it allows Samanth Subramanian to cover different aspects of the country – history, culture, tradition, society, commerce, cuisine and lot more. While the fishes are lovely what stands out is the writing. Right through the book, Subramanian displays a gift for prose and despite tackling what could have quickly become a dull and boring subject, he manages to constantly engross and entertain. Some portions simply stand out – the vivid description of swallowing a live fish and undergoing asthma treatment in Hyderabad, the mouth-watering coverage of cooking fish fry in Mangalore tempting even vegetarians to become wistful, the humorous experiences in Kerala while consuming large quantities of toddy and fish curry – all add up to the most sensational non-fiction debut in India in recent times. After we finished following all the fish that was offered, we came back to the cover and well, maybe it wasn't so bad after all. One question we certainly have for Samanth though – how come Orissa got missed out? There must surely be “something fishy” (used purely in a complimentary sense) there too! Maybe there's more on the way later and if so we wait with anticipation. Buy the book at a great discount now!